The Tories are a dozen seats ahead or they’re a handful behind Labour; the polling percentages are neck and neck and everybody knows there cannot be a straight majority for either. The race is like two old nags stretching for the finishing line, one nose in front one moment, the second inches ahead the next. Amid the controversy about which will be larger and who will treat with whom, there lies a bigger question – why is Labour so far behind? How could a left-of-centre party be fighting for its life against a stridently right-wing budget-slashing government which is missing every one of its economic targets? The pious welfare minister who lives a life subsidised by his father-in-law is stripping life-saving benefits from the softest of targets, overseeing a regime which incentivises welfare withdrawal and leads to suicide and foodbanks. Yet has Labour landed a serious blow on Duncan Smith? Have they harangued him into reversing his cruel policies and made him a figure of contempt – an emblem of a hard-faced, class-war party that must be removed? The average reading of the late polls before the 1997 election which brought Labour to power last time was Tories 30 per cent, Labour 47 per cent – that’s a lead of more than 50 per cent of the Conservative total. That was because the Tory Party was a busted flush, divided and incestuous, while Labour were appealing, modern and well-led. (I know there’s more to it than that, but that’s my shorthand version). If you’re Labour looking to replicate – insofar as you can – Blair’s appeal, you might start with analysis of what the Tory-led Coalition is getting wrong. For a start, here’s a list. Is this the kind of stuff you’re hearing from Labour, because I’m not. I hear the eye-glazing economic targets mantra from Ed Balls and a few stand-alone ideas from Miliband – we’ll freeze energy prices (they’re falling anyway) and we’ll abolish the Lords (honest, we mean it this time). On bankers’ bonuses there are similar noises. Ed Balls wants bonuses to be clawed back for 10 years in cases of misconduct – rather than the current seven. Mmm…not very radical, is it? We’ll chase you for longer but only if you’re found guilty of something. Labour lacks a definitive narrative challenging the basis of the Tory policy framework partly because it knows many aspiring voters side with the Tories and partly because it has locked itself into the austerity mentality which limits spending in popular areas. It isn’t just Miliband who doesn’t wash with the voters. The other one, Balls is a reminder of dodgy economics and bluster from the Gordon Brown era and should have been dumped long ago. The conditions are different from 97 but on the other hand, Major was struggling with an internal enemy (Europe) while Cameron wrestles with an internal enemy (Europe) in the form of UKIP. After 18 years we were perhaps just sick of the Tories and wanted a change. I’m sick of them again but it looks like a large number of English folk are happy with them and it’s not just the middle class in the south-east. A man delivered a car to my house last week from Wolverhampton – a working class bloke doing a low-paid job. He was unabashed to say he preferred Cameron’s Tories to Labour. Instead of hearing narrow-minded Labour MPs moaning about no deals with Nationalists, we should be hearing them explaining why after five years of a neo-con, ideological government, they aren’t miles ahead in the polls and destined to win outright. 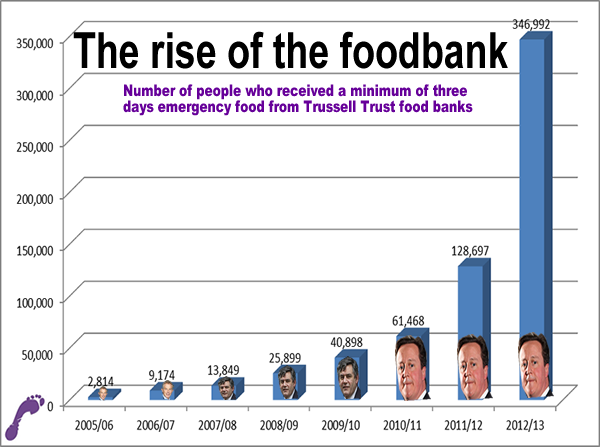 They should be hammering the Tories the way the Tories are hammering the vulnerable. The truth of that is that they don’t have ideas and they don’t have conviction. They are afraid to be who the people want them to be. They are trapped pandering to two audiences and have no clear path to power of programme for government. As in Scotland, the strongest message is: We’re not the Tories. But that only takes you half way to power. Defining what Labour IS seems beyond them and instead others do it for them and are not charitable. Excellent analysis. The problem in UK politics is the Tories. They believe in everything that anyone left of centre despises: inequality, rewarding the rich, hammering the poor, transferring profits from the state sector to the private sector to reward their paymasters in big business and so on. The Labour party may be redeemable, but only if they ditch their tory policies, return to socialism and challenge the neo-liberal consensus. However, they are only interested in power at any price. It’s not power at any price, it’s money and privilege. The Tax free “Expenses” and everything else on the Westminster Gravy Train. But more than that, if the Government Switches, the Oligarch Paymasters switch too. Well is it the Tories? Or is it the press that doesn’t challenge them? It seems to me that the MSM has undergone a conversion to Thatcherism in the last 30 years. Even the Guardian. by the advisors of Ronald Reagan. elitism, ruthlessness, cynicism, privilege, total control, anti-democratic, anti-religion. and a host of other mean and nasty characteristics. all her disciples are just the same , including Cameron Osborne & Milliband. Milton Friedman was the guru of neo-liberalism, but I believe a lot of other players were involved, such as A.Smith Inst under Madsen Pirie. John Weeks debunks Friedman brilliantly in his book “Economics of the 1%” exposing his “theories” as complete nonsense without any substance. Unfortunately, there’s loads of moronic, brain-dead, self-seeking politicians (and economists) out there who have taken it on board and regard it as the holy grail. “TINA”. I don’t think the Tories are the problem. They are just doing what comes naturally. The fact that they lie and spin and get away with it is the fault of a complacent media and the lack of a real political alternative (excluding the Greens and other smaller parties) is the fault of Labour. The most honest policy required for a rethink of UK politics is for Labour to own up that they are now a centre right party of pro-business, pro-banks and pro-austerity. Only when the population of the UK finally realise that will they start looking for true alternatives outside of the main two parties and vote for those alternatives or do as Greece and Spain are doing and see the rise of a new political entities like Podemos. I think the Tories are the problem in that they will never change from a right-wing party. In the past they were less right wing (“one nation conservatism”), but since the Thatcher/neo-lib takeover they have moved so far to the right, combined with an unpleasant populism which appeals the basest instincts of voters, that they are unlikely to move back towards the centre. So what I mean is, that the only chance of the UK having a left of centre party in government is if Labour return to their roots. Also highly unlikely, I know, since they think the only way back into power is by being the pink tories and mirroring all the detestable policies of the blue tories. The history of new parties in the UK has a very poor record in the past 50 years. I think that the answer lies in your question. When was the last time that the Labour Party could be termed “left-of centre”? Certainly not in the Blair era or since. Capitalism for the poor, socialism for the rich aptly sums up the “socialist” credentials of Blair, Brown et al. We see this clearly now. Looks like we are not alone in understanding their poverty of aspiration, of ideas and of compassion. Vote SNP for Scotland’s sake, and for the people of England, who have also been lied to for years. You’re not wrong about Ed Balls. As soon as Labour elected Miliband I knew they stood no chance of winning an election with him (not in the usual sense, at least), but what they think Ed Balls brings to the table is beyond me. Miliband may be a dork, but Balls is just a wee thug, and that comes across even worse. And then you have Reeves in the background who just seems to sum up everything that’s wrong with Labour these days. Mind you, I don’t think any of the folk who stood for leader in 2010 would have gotten them a majority this year. Yvette Cooper might have, but she let her hubby take centre stage instead. I said that the Tories would have been out for at least a decade but then of course we had the disaster that was the Brown years, in that I include the Blair Premiership. Labour made such a mess that let the Tories in, and given we are talking money and that is the God in England, they may very well have to wait until nobody connected with those years are anywhere the levers of power. That Labour are not at least 20 points ahead in the polls speaks volumes, they have no ideas other than copying the Tories, perhaps in a slightly nicer way. I take issue with that, they brought in some of the nastier ideas that have just been extended by the Tories even much if the privatisation of the English NHS can be laid at their door. Miliband is not impressive and as Derek says Balls is a thug. Labour have not been very good a picking Leaders and are equally hopeless in riding themselves of them. Why do you rule out a Labour-SNP-LD-Green-Plaid alliance of some sort? The Lib Dems may yet be the king-makers. They can only boost their electoral prospects by allying with Labour in the exact reverse of their disastrous pact with the toxic Tories. If the Tories are the biggest party then the Lib Dems won’t have much choice but to deal with them again. They may see the current polling as rock bottom as it were and if they can maintain a decent number of MPs despite this based on localised support then they may feel their best opportunity of re-building is to continue as the main partner in a stable coalition for another 5 years and hope to be more successful at demonstrating real influence in Government. Lab-SNP-LD-Plaid-Green alliance destined to be messy and they’d lose their distinct voice as the ones who are curtailing the worst of the Tory excesses to their louder and more radical coalition partners. This is a repeat of the lie that the biggest party gets to form the government. The incumbent party has first go, if there is a hung parliament. But if it is unable to, for instance if they don’t have an absolute majority, and the Lib Dems won’t partner them, then whatever grouping can command a majority of seats will have the chance. No it’s not – I’m just saying if the Tories lead by 10-30 seats as current predictions suggest then it’s in the Lib Dems interests to use that as an excuse to stay in coalition with them in the interests of stable governance (and another crack at the whip of being in government). If it’s close to a dead heat or Labour have most seats then Lib Dems more likely to deal with Labour. Nothing to do with who gets to form Govt. – simply about what the Lib Dems are most likely to do in a given scenario and in my opinion they will almost certainly side with the party with most seats. It’s wishful thinking to believe they will go out of their way to avoid another coalition with the Tories – they have demonstrated they are more than happy with their contribution over the last 5 years and never once have seriously distanced themselves from Tory policy despite many people (you and me both I suspect) thinking it’s their only hope to win some voters back. I didn’t mean to accuse you, sorry if it read that way. Just that in electoral terms they might review their coalition with Tories as suicide, and if an alternative government might be formed to the left, strategists might see that as a way for them to regain some lost popularity. Bearing in mind, that if they propped up Labour, they could still have a place in the Cabinet. Can only say that if Labour had a clue they would be dangerous, but as you say they are stuck between two worlds which are so very different. They would have been better served to have let the Scottish Branch go and vote for Independence instead they have been throttled by the Tories and scuppered by the SNP. I think it more a case of lacking bottle than lacking conviction. The question must also be is, how could the Tories have at the last election to win an outright majority against the most sleaze ridden, corrupt government in living memory, whilst having nearly the entire media on their side entire . Now we have labour who can’t win an outright majority against the most vicious, greedy, incompetent and unjust party in living memory. Whilst may I add having a voting system which should theoretically only be able to return a party with a great thumping majority. I’m afraid the delivery person from Wolverhampton does not represent the majority thinking of the electorate in England, when it’s quite plain to see that people south of the border are getting heartily sick and tired of both parties and appear to be stirring and franticly looking about for an alternative. Labour are a complete waste of time and space. They don’t know who they are or what they are for, they have no ideology anymore, and they can’t even make up their minds if they are Tories or not. Why we even use the energy discussing this busted flush is beyond me. You only have to look at the faces Labour mp’s, and what you will see is the fag end of the last sleaze ridden Labour government, Prescott, Darling, Brown, Alasdair Campbell, Ed balls etc. The fact is that the country is split. Thirty-six years of neoliberalism has provided huge dividends to the rich and the bankers in financial services. But at a cost of dissolving the social glue that held Britain together. And with that, the concept and identity of the UK itself and thus its viability as a political entity. They, the Thatcherites, have poisoned the well from which they must drink. Hell mend them. It’s not just in Scotland that things have gone awry. There are now English localities which show distinct regional voting preferences; the Lib-Dems in the SW, UKIP in the Thames valley, and Labour in the NE. The Tories are a party of the Home Counties and the countryside. The UK is breaking apart. Out of a dissolution of the structures that held it together. Only the BBC remain the cheerleader, but for a country nobody any longer recognises. The real puppet master is the Civil Service which is the real longterm piece in the Establishment organic jigsaw. I agree that the Whitehall civil service is a kind of political glue holding the UK together. But I meant the social glue, what would voluntarily make you feel any positive identification with being British. Plus, we do have our own civil service in Scotland, so that to some extent weakens Whitehall. Has to be said the problem in UK politics is… that the Tories keep getting elected. They have an authentic voice for some people – $DEITY knows why – and so the ersatz version that Labour offers isn’t convincing. The problem with UK politics is there is no electable alternative – other than in Scotland where fortunately we have the SNP. You’re right neo-liberalism has produced huge dividends for a very small section of society, but they, and their political puppets, have on the one hand, persuaded the rest of us that we’re all doing very nicely (which we’re not – real wages have stagnated for about 30 years for example) and on the other created scapegoats: the poor, the unemployed, immigrants, the European Human Rights Act etc to bring out the worst in voter’s instincts and distract them from reality, and with no-one to challenge these “givens” (apart from some brave academics) then people start to believe the lies and spin. Derek. If a Tory-LibDem-DUP Govt comes to pass, does this condemn SNP to being “The Feeble 50” post May? They might be technically in a poition of impotent power if that happens, but are hardly going to take this meekly (unlike Labour when they were the feeble 50) and I would expect them to make waves in any way they can. Does that not depend on how many Tory/ Libdem MPs are elected in Scotland ? If you have a large contingent of SNP v one Tory v a Labour Party where it’s not a case of ‘can’t ‘ stand up for the people but won’t stand up for the people ? SNP numbers aside , that looks awfully familiar? So the reality is , IF a large contingent of SNP are voted in , they are never going to be feeble because let’s be honest , what happens if Labour lose? They elect a new leader and then what ? Same with the Tories ? An EU referendum , renew Trident, Scottish elections? The same issue is going to keep surfacing , The Scottish question ? To sum it up Derek ..I agree I think it probably is too late for Labour. Of course the Scots will get the blame. The fact that Labour failed to persuade the voters in the country with 85% of the population in these islands will be a mere incidental…no it will be the Scots fault. Great dissection and evaluation Derek. The scary part about our current incarnation of Labour is that they have to tell you they’re not the tories. It really should be self evident. Except its not, is it? It really is worth 15 minutes of your time. He also states explicitly that Westminster convention makes it quite clear that in the event of a hung parliament the existing Prime Minister gets first shout at forming a new Government which “carries the support of the majority of the House” and only stands aside when it becomes clear she/he cannot do that. But is has nothing to do necessarily about which party has the largest number of seats. So this time, as seems likely, if we have no clear winner after May 7th Cameron gets first chance. As for blaming the Tories for being Tories – come on. That’s just like the old parable of the scorpion and the frog. They are the party of the rich, for the rich by the rich. Everyone knows that. So if people who are not rich vote for them anyway whose fault is that? Certainly not the Tories nor their supporting press barons. We are talking about choices made by millions of autonomous adults. We can’t keep treating them like nursery children and say it’s all the fault of the nasty Tories that millions of people vote for them. I have never voted for them and never will but I don’t think that makes me smarter than my fellow voters. The problem is England or rather English politics which,perhaps because of the Westminster electoral system,has had a long love affair with Margaret Thatcher’s policies. Any party which seeks power at Westminster,that meaning a majority of English seats,is going to have to toe the neoliberal line because,let’s face it,There Is No Alternative. The reason the London establishment and it’s right wing press pack are so hysterical about the possibility of the SNP having any influence is because it would expose the whole Westminster political system as bogus and just a scam to keep the rich rich at the expense of everyone else. Maybe “Red” Ed will get a chance to enact progressive policies in England but only with the support of a large number of Scottish SNP MPs. Otherwise,we are just going to see a continuation of “greed good” and Scotland being completely ignored as usual. Thank you again Derek. And the commentors; as erudite and interesting as ever. But with echos of 2014 and social media up to the 17th September – all the correct analysers and commentors did not present the view showing what might happen in Non-Yes-Shire. Where are we today as 7th May approaches? What is actually happening out there? I’d kinda pinpointed at the start of 2012 why Labour would lose, as it seemed that all of the reasons were already in place. Inability to formulate an alternative to austerity (coupled with a failure to rebut the need for scorched earth), lack of policies, overkeeness to revisit the Blairite policies that failed (like “Light Touch Regulation”), oh and a failure to think outside the box regarding Scotland’s place in the Union…. When the earthquake hits, there will be no telling how the structures will fall. But in Scotland, the one great fall will be London Labour. I can’t for the life of me get it out my head that Con/Lib/Lab are all one and the same party-i.e. the Westminster Party. They will do whatever they are told to by the real Ruling Class masters-civil service flunkies of Her Majesty,the head of the British State Hydra. Labour have been in intentionally managed decline as that suits the whole debacle to have a useless ‘opposition’ to be fed to the public and give the impression they’re something different from the Conservatives-keeps the pretence up rather what? Just like when dunderhead Brown chose not to work with the Libdems and SNP to form a government so the Conservatives can have their go. So the scandal of this charade can be played out ad infinitum.